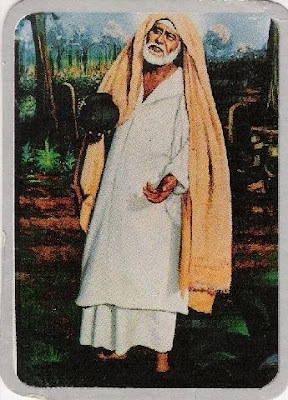 I have been posting many Leelas and life stories of Sai Baba and His devotees since two months. A feeling that this blog of mine is static and not interactive has aroused in my mind. It seems as if Sai devotees (and many others) just read the write ups and the main Updesh of the story does not reach to them. So now onwards I will leave it to the readers to get the Upadesh and share their opinions with others (and me). Unlike other posts I will not give introduction and disclose the main theme of this post in the beginning only. Instead I am reserving it for the end. Thakordas lived in Surat city in Gujarat. He worked in a factory where Jari (embroidery) work was done. The factory had two branches, one in Selam and other in Coimbatore. In the year 1945, Thakordas went to visit the factory of Selam. While he was returning to Surat, the glory of Sai Baba came to his ears and alighted at Ghond station. He bought a ticket of Chitali. After reaching Chitali station he hired a Tonga and reached Shirdi. He took the darshan of Sai Baba’s Samadhi. His mind got so engrossed in the environment of Shirdi that he did not wanted to leave Shirdi even after 2 days stay. On the other side, news was sent to the family of Thakordas that Thakordas had left for Surat. But as Thakordas did not reach Surat, his family members started worrying. They all started searching him through telegrams-telephone in expected places. All their pains to find Thakordas did not bear any fruit. On the third day, Thakordas was sleeping on the threshold of Shirdi’s house after having lunch to his hearts content. Suddenly a fakir appeared before him. Thakordas got up at one and folded his hands. The fakir said, “You are snoring here calmly and your family is searching you.” The fakir did not spread His limbs for Dakshina, just spoke these words and went away. In this way Thakordas came to know about his family’s search for him and returned to Surat. Sai Baba is always with the one, who bows in the Holy Feet of Sai Baba. Now another question arises that is Sai Baba with us even after 90 years of taking Mahasamadhi. The only answer to this is Sai Baba has no beginning and no end. He is forever with us knowingly and unknowingly. We daily come across some or the other incident in which we can see His Leela.